The Highlands is located just Southeast of Downtown Louisville at the end of East Broadway the North and extending to the Watterson Expressway. Five minutes from central Downtown, walking distance from world-class parks and golf courses, and nestled between the City’s best restaurants and shopping, is the beloved Highlands neighborhood. The Highlands is the home for the active “Louisvillian” who enjoys culture, arts, and true community living. The Highlands is a neighborhood with a pulse, and the tree-lined Cherokee Road is the Highlands’ heart. The Highlands is a neighborhood with daily, weekly, and annual traditions. Neighbors enjoy their morning cups of coffee on their front porches, walks with their dogs in the park, and rely on their political discussions at the corner coffee shop. Weekly events include the Saturday Farmers Market, and the Summer Concert series at Willow Park. Every year, for one weekend the Highlands is the place to be for the annual Cherokee Triangle Art Fair which draws artists from all over the Country. The Highlands is home to several beautiful Parks including Tyler Park, Douglas Park, Willow Park, and Seneca Park, but the heart of the Highlands is Cherokee Park. Cherokee Park was designed by Frederick Law Olmsted, and encompasses 409 acres of beautiful land which includes a 2.4 mile loop for dog walking, running, or biking. Cherokee Park also offers a golf course, playgrounds, recreation areas, mountain bike trails, and some of the best sledding in town! There is a lot of variety when it comes to homes in the Highlands. Home styles include Bungalows, Cotswold Cottages, Craftsman, and ornate Victorian. Some of the most expensive homes in the City are found in the Highlands. 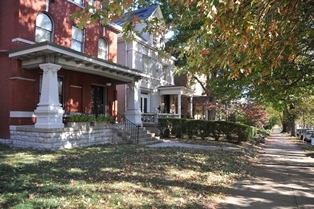 The Cherokee Triangle neighborhood in the Highlands is one of the most prestigious in Louisville. Homes in this area generally cost over the 1million dollar mark. With the exception of the Cherokee Triangle neighborhood, the Highlands has a variety of home options, with a median home price of $215,000 and a price per square foot average of $123. The Highlands is often called “restaurant row,” boasting 3 miles of high end and locally owned restaurants, bars, and coffee shops. Jack Frys, Avalon, Seviche, and Le Gallo Rosso, are all excellent restaurants if you want a romantic night out. If you want to bring the kids, or just want something a little more laid back, try Dragon Kings Daughter, Molly Malones, Marks Feed Store, Papalinos Pizza, or Ramsis Café on the World. All these restaurants are within the 3 mile walk of Bardstown Road. You can get after dinner coffee at Heine Bros. or frozen yogurt at Lulus, or check out the nightlife at one of the many bars Bardstown and Baxter Road have to offer. The Highlands is in Louisville’s Jefferson County School District. Nearby schools include Bloom Elementary, Collegiate School, Atherton High School, and Barret Traditional Middle. Louisville Homes Online features the best Highlands real estate MLS search for homes, condos and land available in the Highlands Neighborhood. We have worked hard to ensure this is the only site you will ever need. It is easy to use and navigate through Highlands real estate searches. The listings on our site are updated daily from the Louisville MLS. Additionally, you are able to get new property listings daily that meet your search criteria. We would be happy to answer any questions you have.